About why BigSpot is a SCAM! There are many online companies that claim that they give rewards and money only for filling simple forms but out of them there are very few that genuinely pay you something. 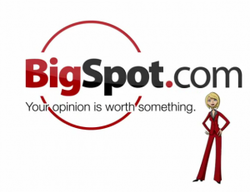 Bigspot is one of those companies that claim to give money for your participation in online surveys. In order to get yourself registered on the website of Bigspot, fill out your information in an online form that includes email address and then select a survey for filling out that matches your demographics. The commercial advertisement of Bigspot often runs on TV in which they claim to be a legit online paying website through which you can earn a lot of money just by filling some surveys which take you a very little time. But truth is not that now-a-days due to economic pressure everyone seeks an extra income, no matter coming from any source. In this way people are fooled by many online survey companies like Bigspot. Bigspot scam has become one of the most discussed topics on internet. Once your email address is leaked, your junk of mail starts flooding with fake mails that sell you products, and you think they would help you have the relevant survey. Many people get attracted to Bigspot by watching it’s advertisements on TV. But most of the times, it turns out to be fraud. Basically, all Bigspot needs are your personal data. They use this personal information for their own ends. The designer of Bigspot must have been very smart, he knew that how to convince people to share their personal information with you that is not ethical at all. After logging on the site of Bigspot there is a form that appear on your screen, you are not given access to surveys until you get yourself registered on the site. It has been noticed that they don’t consider your personal data while giving you surveys which they must, because a man from Africa can’t assess services given by Wallmart. Bigspot scam is associated with different companies and on giving your data to it; it quickly forwards it to those companies that do mail marketing and consider you as a target market. Bigspot.Com is given money by those companies which use it to fool people. A legit survey company that pays you never asks for your email id, the most irritating thing about junk mails that are automatically received by you is that they could never be unsubscribed because you don’t subscribe by choice. Instead, Bigspot put you in this situation. Bigspot scam does the unethical act of sharing your information with third party. Bigspot is guilty of fooling and wasting time of great number of people by giving them a hope of winning some cash that merely wastes their time and doesn’t give them anything else. Not all of survey companies are fake, for there are few companies that give less amount of money but are legit ones. You need to do a little research for finding legit survey companies on the internet that will save your time and make you avoid a lot of junk mails. There is one thing that you need to keep in your mind is that the legit survey companies that pay you less are not able to make you rich overnight. But still they can prove to be a source of some extra income. These legit online companies are only looking for unbiased and honest opinions that will help them improve their products.